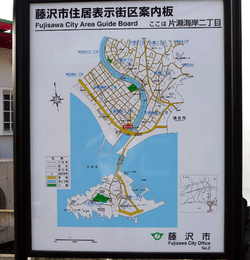 The Area Guide Board at Katase-Kaigan 2-chōme area, Fujisawa, Kanagawa. Block (banchi) is indicated with circled number and building number (gō) is not displayed. Japanese addresses begin with the largest division of the country, the prefecture. These are generally called ken (県), but there are also three other special prefecture types: to (都) for Tokyo, dō (道) for Hokkaidō and fu (府) for the two urban prefectures of Osaka and Kyoto. Following the prefecture is the municipality. For a large municipality this is the city (shi, 市). Cities with a large enough population, called designated cities, can be further broken down into wards (ku, 区). Tokyo has both ordinary cities and special wards (tokubetsu-ku, 特別区), each of which has the status of a city. For smaller municipalities, the address includes the district (gun, 郡) followed by the town (chō or machi, 町) or village (mura or son, 村). 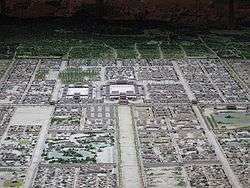 In Japan, a city is separate from districts, which contain towns and villages. However, exceptions abound, and the line between the schemes is often blurry as there are no clear delimiters for machi, aza, etc. Note while almost all elements of the address are reverse in roman, connected strings of numbers are treated as units and not reversed. 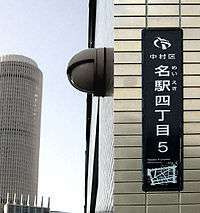 Firstly, the "city block and building number" is a unit, and its digits are not reversed – in this example it is "5-3" in both Japanese and roman, though the Japanese (literally Yaesu 1-Chōme 5-3) is partly reversed to "5-3, Yaesu 1-Chōme" in roman if chōme is separate. Similarly, if the chōme is included, these also form a unit, so in this example the string is 1-5-3 in both Japanese and roman. 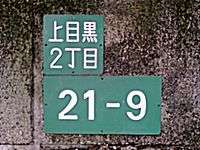 As mentioned above, there are certain areas of Japan that use somewhat unique address systems. Sometimes the differing system has been incorporated into the official system, as in Sapporo, while in Kyoto the system is completely different from, but used alongside the official system. Kyoto and Sapporo have addresses based on their streets being laid out in a grid plan, unlike most Japanese cities. Sapporo’s system, though official, differs in structure from regular Japanese addresses. The city-center is divided into quadrants by two intersecting roads; blocks are then named based on their distance from this point, and farther from the city center, multiple blocks are included in each. The east-west distance is indicated by chōme (a slightly unorthodox usage of chōme), while the north-south distance is indicated by jō, which has been incorporated into the chō name. Named Roads, or 通り (Dōri), are roads or sections deemed noteworthy and given a name. Unlike in other nations, named roads are not used for addressing but merely for ceremonial purposes. An older chōme address name plate in Kuwabara, a residential section of Matsuyama, Ehime. The address of this block in Japanese is 愛媛県松山市桑原４丁目3. ↑ "Access (アクセス)". kyoto-tower.co.jp (in Japanese). Retrieved 2016-05-25. ↑ "JR Tower Access" (in Japanese). ↑ "札幌立花病院｜-アクセス- (Sapporo Tachibana hospital access)" (in Japanese). ↑ "区役所案内／札幌市豊平区 (Sapporo Torohira Ward)" (in Japanese).